New York, NY (September 29, 2014) - The board and staff of the National Kidney Foundation mourn the passing of former NKF Medical Director Ira Greifer, MD. Dr. Greifer passed away on September 17, 2014. Dr. Greifer was a world-renowned pediatric nephrologist and Professor Emeritus of Pediatrics at the Albert Einstein College of Medicine. 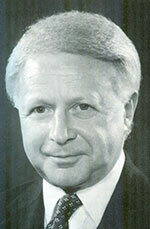 He was appointed to the position of Medical Director to the National Kidney Foundation in 1966. He also served as president for the National Kidney Foundation of New York and New Jersey. Under his direction, the National Kidney Foundation established a number of research programs, kidney disease detection and prevention initiatives and professional education seminars. He worked tirelessly to partner with government organizations to further the care of patients with kidney failure. Dr. Greifer was also instrumental in convincing Senator Jacob Javits to push legislation adding "Kidney Disease" to the name of the National Institute of Diabetes and Digestive Diseases.